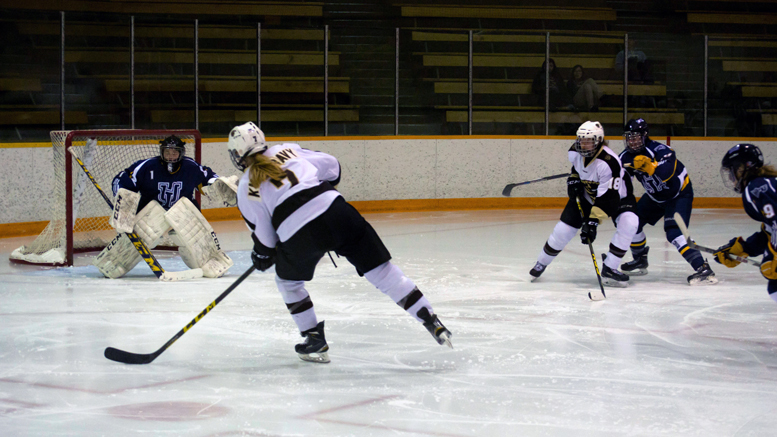 After two consecutive upsets in subsequent weeks, the University of Manitoba Bisons women’s hockey team saw their dream run come to an unfortunate end in the conference finals this past weekend, falling two games to one on the road against the UBC Thunderbirds. Close games were an element of hockey familiar to the Manitoba Bisons this season, having played in seven one-goal contests since January. However, on Friday night, the herd was on the losing end in their game one tilt at UBC, dropping the contest 2-1. The Thunderbirds took the lead midway through the first period, with Shiayli Toni scoring her first of the postseason. The Thunderbirds regained the lead before the first period was over. Mathea Fischer managed to chip the puck over Bisons goalie Amanda Schubert one minute after the Bisons tied the game. Fighting a 2-1 deficit, the visitors turned up the tempo on Dube. After firing five shots in the first period, the Bisons managed eight in the second, then 14 in the third period. Despite their push to equalize for the second time in the game, Dube remained sharp. The fifth-year netminder could not be beaten in the last 40 minutes. With a star-studded performance from their goaltender, UBC hung on for a narrow win. Manitoba gave themselves a chance to take out second-ranked UBC on Sunday, after a resounding 4-1 game two win on Saturday. It was the hosts who took a very early lead in the game. Defenseman Kelly Murray opened the scoring just two minutes into the first period. Dube saved 10 shots in the frame to keep UBC in the lead after 20 minutes. If the home side had any momentum entering the second, it was taken away in an instant. Venla Hovi struck just seven seconds into the frame to tie the contest at one. Sharman recorded the lone assist on the goal, extending her playoff point streak to four games. The Bisons did not let up for the remainder of game two. Erica Rieder scored the go-ahead goal midway through the third period, her first of the postseason. Less than a minute and a half after taking the lead, the Bisons found an insurance goal through Erin Kucheravy, extending the visitors’ lead to 3-1. The scoring was rounded out with Hovi’s second of the contest and playoff league-leading sixth goal in the Canada West conference. 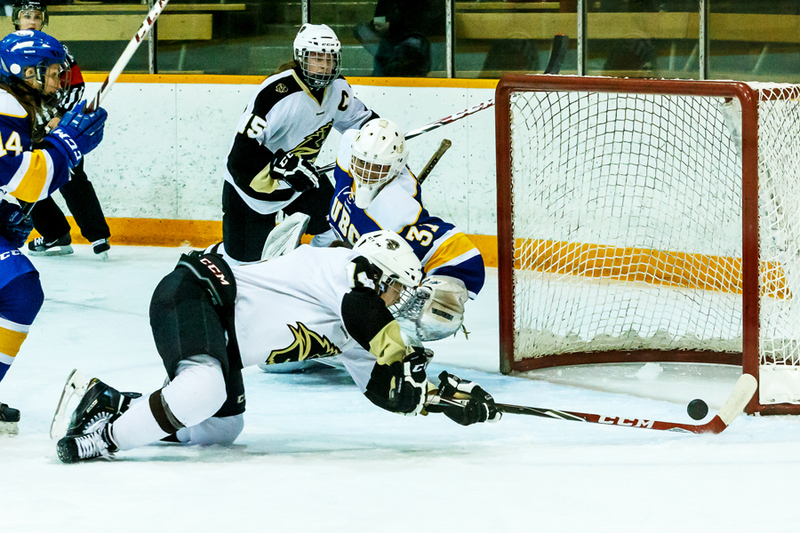 In each of the first two series of the Canada West postseason, the Bisons took their opponents to a game three and stole victories away from home. On Sunday night, their impressive run in the playoffs came to an end as the Thunderbirds clinched a decisive 2-1 win. The Bisons trailed for the entire 60 minutes and despite Karissa Kirkup’s late goal providing a spark, the herd couldn’t overcome UBC. The T-Birds began booking their ticket to nationals early in game three by getting their noses in front just three minutes into the game. Defenseman Celine Tardif scored her first goal of her postseason and UBC took the 1-0 lead. Although the Thunderbirds were on the board, momentum fully swung the way of the Bisons. Manitoba outshot the hosts 12-3 after one period, with Dube keeping the herd scoreless. The T-Birds responded in the second, outshooting the Bisons 9-4 in the frame. Schubert was sharp to keep the game 1-0. To begin the third period, Bisons blueliner Caitlyn Fyten took a body-checking penalty that proved costly for Manitoba. Logan Boyd capitalized for a two-goal cushion. With their season on the line, Kirkup managed a powerplay goal with two minutes remaining and gave the Bisons some light. Unfortunately for the visitors, time was against them and the buzzer sounded to send them home with a 2-1 defeat.